Looks like its too late to get one, wondering if there is going to be a restock in the next month. Please don't stop selling. My priorities are coming round the mountain. There is no way in heck I would ever make him stop selling Nanoloop carts. After all, NL 2.3 and the gameboy camera were my introduction to the chiptune community. 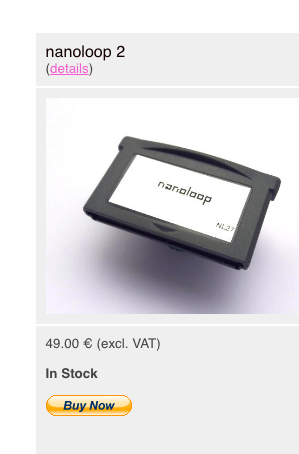 I'm actually thinking about getting a preloaded Nanoloop 2.7 cart with Nanoloop 2.2 on it, since I've been practicing with the Nanoloop 2.0.1 demo rom. Glad to have been one of the people to have asked, my 2.2 cart is on the way here and it will be fun playing with 8 tracks of nanoloop magic over the holiday, thanks Oliver!